Looking for the best 55 inch TV for your budget? If you've got the space then a 55 inch TV tends to be the ideal sweet spot between price and performance. While it's a struggle to find high-end technologies like OLED panels and Dolby Vision with 32 inch TVs or 40 inch TVs, they're much more common in larger sizes. LG produce a dizzying array of different OLED TVs, but the important thing to realise is that each of them have completely identical screens. That means that the B7 is an absolute steal in terms of its picture quality, which has every bit of depth, vibrance and clarity as the W7 that costs several times its price. Where LG has cut back in order to offer this set at a more affordable price point is with its sound, which is the weakest of LG's entire range. We're not bothered by this sound complaint for a couple of reasons. First off is the fact that if you're spending this much on a TV, then you really should be buying an external sound system in the form of a soundbar or set of speakers. Secondly, we just can't get over the B7's price. It's a price point that makes a complete mockery of the high-end LCD market, and we think slightly weaker sound is a completely fair tradeoff when the picture quality is this good. As a final point, the B7's phenomenally low input-lag (most have measured it as being around 21ms) means this is a great gaming TV. It's an open secret within the TV industry that all of the manufacturers of OLED TVs are using the same panel as LG, which really begs the question of why you'd want to spend extra on a non-LG set. The answer in the case of Sony's KD55A1 is obvious; it's absolutely amazing at upscaling HD/SDR content to look almost identical to modern 4K/HDR content. That's an important bit of functionality. Although in an ideal world everything we watch would be in 4K/HDR, the fact is that until the transition is fully completely we're likely to be stuck with HD/SDR content for the forseeable future. The A1's upscaling abilities are thus incredibly important if you want this content to look as good as possible. There are a couple of downsides to this television that are worth bearing in mind. The first is that all this upscaling has an impact on input lag, which just isn't as good as the B7's. This means that in order to get the best gaming experience you'll either have to use a 4K console (which means sadly no PS4 or Nintendo Switch) or turn off the upscaling tech (at which point paying the price premium for this TV doesn't make nearly as much sense). Finally, the TV's stand is a bit of a love it or hate it affair. Its aisle-style design is certainly eye-catching, but seriously limits the kinds of stands you can place the TV on. It's not the worst thing in the world, but it's worth bearing in mind. Not everyone has the budget for OLED, we get it, but that doesn't mean you have to settle for a terrible picture experience. Nothing makes this point more clear than the Hisense H55N6800. It might be a 4K TV from a budget-focussed brand, but there's very little to sneer at here. HDR performance is decent thanks to the set's ability to offer great highlights, and the build-quality of the entire TV is also pretty good to boot. Toshiba's smart OS is less proven than its competitors, but there's enough here to get the job done thanks to support for all the major catch-up and streaming services. You won't get nearly the same quality of black levels as its OLED competitors, but if you want 4K HDR on a budget, then the Hisense H55N6800 is a great choice. At the cheaper end of the 55 inch TV spectrum your priorities have to shift a little. Whereas premium sets are all about offering scorchingly bright highlights and lovely deep blacks, you have to lower your expectations a little more if you're paying this little. So what can you expect from the Philips 55PUS6272? Most notable is the Ambilight technology, which uses a series of rear-mounted RGB LEDs to project light onto the wall behind the set. In theory this is supposed to reduce the eye strain you get when you watch TV in a dark room, but in reality we just like the pretty colours, and we're sure you will too. Smart functionality is also good, with a combination of Android TV and Freeview Play offering fast and easy access to all the streaming services you require. You won't get the most stunning looking picture quality out of this set, but rest assured that if you're buying a TV on a budget then you could certainly do a lot worse. Of course, if you want to pair the delights of Ambilight with a more premium TV, then Philips is more than happy to oblige. 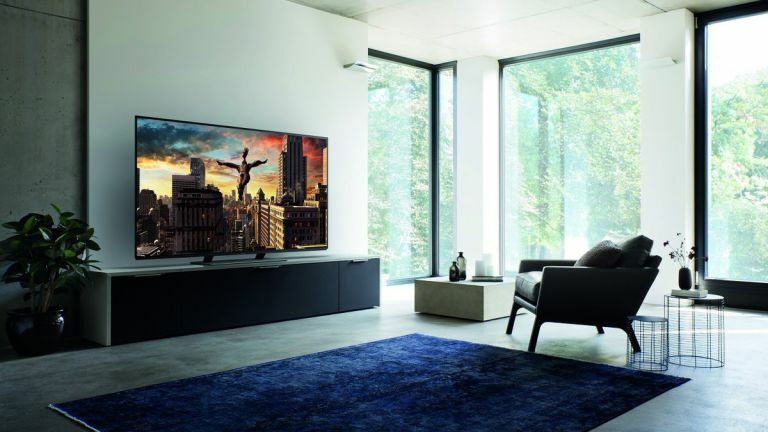 Enter the Philips 55OLED873 (which confusingly was renamed from 55POS9002 in 2018), a TV that features a stunning OLED panel alongside the company's great wall-illuminating technology. Since this TV's price is so closely matched to the LG B7 above, going for it will certainly be a matter of preference. Its colours are lovely and vibrant, but other sets offer slightly more realistic neutral tones, and its motion-handling could be a little better. If you want the absolute most accurate colours a 4K television is capable of, then Panasonic's TX-55EZ952 is the set to go for. The EZ952 comes at a significant price premium over the other OLEDs on this list, but what that extra money is getting you is a phenomenally accurate display, that shows you colours and detail exactly as the creator's intended. It's a difference that's going to be all but imperceptible to all but the most discerning of viewers, but if you want the most accurate image quality around, then this is the set to beat. Unfortunately, the sound side of the equation isn't nearly as impressive. The EZ952 lacks the soundbar of the EZ1000 which results in much weaker sound, so an external sound system is a must if you want an audio experience to match up to the picture. It's the most expensive TV on this list and won't be for everyone, but if it's accuracy that you need at 55-inches, then the Panasonic TX-55EZ952 is the set to go for. Looking for more home tech advice?